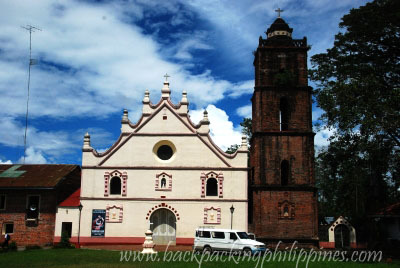 Reputedly the best preserved old stone church of Nueva Vizcaya can be found in the town of Dupax del Sur that Tutubi tried to pass by just to take a pitcure of the really impressive facade with red bricks for the old belfry. Dupax del Sur is a town in Nueva Vizcaya that you'll pass by if you're going to Isabela and Tuguegarao (Cagayan) but this old church is at the town center, quite a distance from Maharlika Highway en route to Bambang, Bayombong and Solano towns. An unplanned trip actually, Tutubi found it by asking locals where it is but he was only able to find it after a few tries in nearby Dupax del Norte. The church interior may be great to marvel but Tutubi had to go to catch on time plus his stomach is complaining as it's already lunch time. Doing a Nueva Vizcaya Visita Iglesia may be a different activity, somewhere north east of Metro Manila and about hours away by land. I have visited this thrice. The interior is very simple, save for the two pillars and baptistry covered with carved stucco. These stuccos makes this church very unique and interesting! The motifs and designs are obviously inspired by European design but given a folksy execution by the local artisan. the cherubs looks a bit like anitos in the pillars. Some of the images in the church are native looking too. You can also ask permission in climbing in the belfry, but prepared to get dirty. The stairway is very very narrow and dingy, but the view from the tower is great! The convent beside the church is very nice too. it is well preserved.